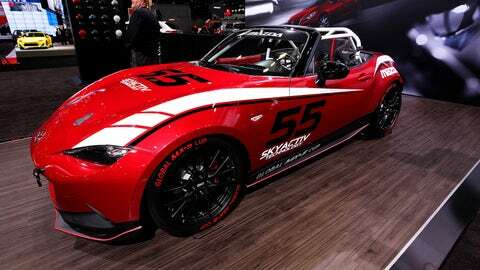 The 2016 Mazda Global MX-5 Cup Race Car, seen at the 107th Annual Chicago Auto Show at McCormick Place in Chicago, Illinois on Feb. 13, 2015. Nine individuals have been listed as finalists for the 2015 Mazda Road to 24 Shootout, as they seek a $100,000 Mazda Scholarship to race in the 2016 Battery Tender Mazda MX-5 Cup. The shootout will be held at Carolina Motorsports Park in Kershaw, SC from Nov. 8-10, where the drivers will be tested not just on their on-track performance, but also on their technical knowledge. Of those nine drivers, two of them – Richard Eklund and Glenn McGee – were able to race their way in through iRacing, an online international sim racing service, which features the Mazda MX-5 Cup car. Drivers in the Mazda MX-5 Cup who have gone on to achieve further success in motor racing include FIA WEC racer Patrick Dempsey, Formula E and IndyCar racer Simona de Silvestro, NASCAR and Continental Tire Sports Car Challenge racer Chad McCumbee, Indy Lights champion Spencer Pigot, and Continental Tire Sports Car Challenge racer Stevan McAleer, who won the MX-5 Cup in 2013.